Rather you enjoy taking a walk during the day with your dog or you prefer taking a walk in the evening when it's dark outside you really need to make sure you are taking precautions for you and your pet. I really instantly discovered Illumiseen which has products to have you and your pet be seen and I was sent the following items a reflective LED Dog Safety Vest in orange it comes in sizes extra small, small, medium, large, and extra large. The LED dog vest features three bright, attention-grabbing lighting modes and is durable enough to withstand even the harshest of weather conditions. 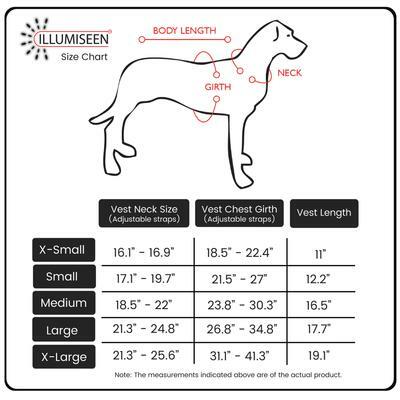 The reflective dog vest fits dogs of most sizes and is easy to slide on, adjust, and use. Simply place the micro-USB, rechargeable battery inside the attached pouch, connect it to the vest, and press the on/off button to toggle between slow flashing, rapid flashing, and static/solid mode. 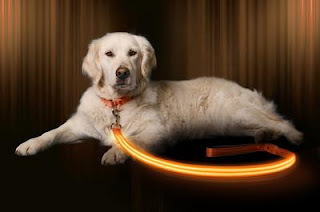 LED Dog Leash USB Rechargeable in orange the leash features an easy-to-use metal clip that snaps onto the D-ring of the collar within seconds, and it is designed to help you and your pup stay visible to motorists, even in low-light conditions. With one simple click, choose between slow, rapid, or steady flashing glow modes based on the outdoor conditions and your intended route. The busier the road, the more illuminated the leash should be. The LED dog leash is durable, sturdy, lightweight, and features a USB-rechargeable battery that provides five hours of illumination per one-hour charge. My Opinion: I specifically won the orange color because I live in the woods and it is hunting season right now in Maine so I want to make sure that me and my dog Fiona was protected but we went outside walking. I really enjoy how the vest fits Fiona the only parts that I don’t like is the cliff underneath she doesn’t like things like that attached to her she did okay wearing this well we went out for a walk and I just took it off on your home. The leash is also very bright and sturdy as I tested it at night time and it is nice and bright to be seen during the day as well.